The Array commands copy a selection set in a rectangular or polar (circular) pattern or along a linear entity. For a rectangular array you must specify the number of rows and columns and also the spacing between subsequent rows and columns. To create a polar array you will be prompted to specify the center point of the array, the rotation step and the number of items in the array or the angle to fill. 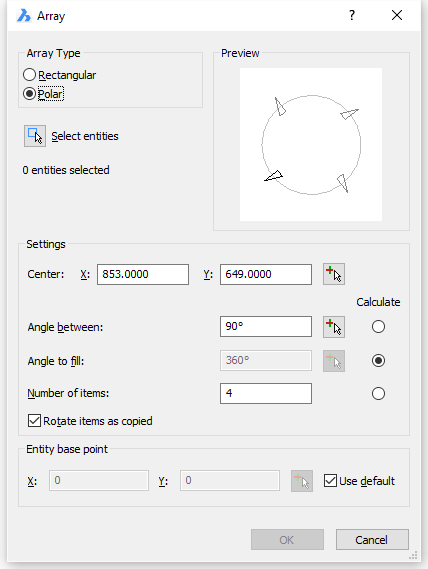 You can choose to rotate the selection set about the center point or to keep its original orientation. The ArrayClassic command creates a static polar or rectangular array of entities through a dialog box. The -Array command creates a static polar or rectangular array of entities. The Array command distributes entity copies in an evenly spaced associative rectangular, polar or path array. The ArrayRect command associatively distributes entity copies into any number of rows, columns, and levels. The ArrayPolar command associatively distributes entity copies evenly in a circular pattern about a center point or axis of rotation, using multiple rows, and levels. The ArrayPath command associatively distributes entity copies evenly along a path into multiple rows, and levels. The ArrayEdit command allows editing associative arrays and their source entities. Type arrayclassic in the command bar, then press Enter. 2. Under Array Type choose Rectangular . 3. Click the Select Entities button ( ). The Array dialog box closes temporarily to let you select entities. 4. Select the entities, then right click or press Enter. The Array dialog box reopens. 5. Fill out the Settings fields or press the Pick Points buttons ( ) to define the settings graphically. The Array dialog box closes temporarily to let you pick point in the drawing. Row offset (A) and column offset (B) can be defined by the spacing rectangle (red). 6. Click the OK button to create the array. Positive values in steps 4 and 5 are measured along the positive X- and Y-axis of the current UCS. Negative values are measured in the opposite direction. 2. Under Array Type choose Polar . 5. Choose a Calculate option: Angle between , Angle to fil l or Number of items . The settings field of the selected option is dimmed. 6. Fill out the Settings fields or press the Pick Points buttons ( ) to define the settings graphically. 7. (option) Check the Rotate items as copied option. Entities rotated (left) or not (right) about the center point of the array. 8. (option) Define an Entity base point . Polar array with base point (dot) and center point (cross). Click the 3D Array tool button ( ) on the Modify toolbar. Choose 3D Array in the Modify menu. Type 3darray in the command bar, then press Enter. 2. Select the entities, then right click or press Enter. 3. Choose Rectangular in the prompt menu or type R in the command bar and press Enter. 4. Type the number of rows in the command bar, then press Enter. 5. Type the number of columns in the command bar, then press Enter. 6. Type the number of levels in de command bar, then press Enter. Type the distance in the command bar and press Enter. Specify the distance by clicking two points. Positive values in steps 7, 8 and 9 are measured along the positive X-, Y- and Z-axis of the current UCS. Negative values are measured in the opposite direction. 3. Choose Polar in the prompt menu or type P in the command bar and press Enter. 4. Type the number of items you want in the array, then press Enter. Type the angle to array, then press Enter. Press Enter to create a 360° array. 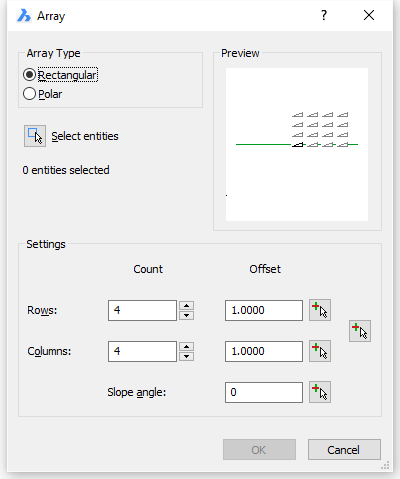 Press Enter to rotate the entities about the array axis. Type N and press Enter to keep the original orientation of the entities. You are prompted: Center of polar array. 7. Specify the first point of the array axis. 8. Specify the second point of the array axis. Polar 3D array about a horizontal axis (red).